I like to experiment a lot with coding and creating html, css, js etc. files each time I want to try something is tiring. To get around this, I have created template html, css, etc. 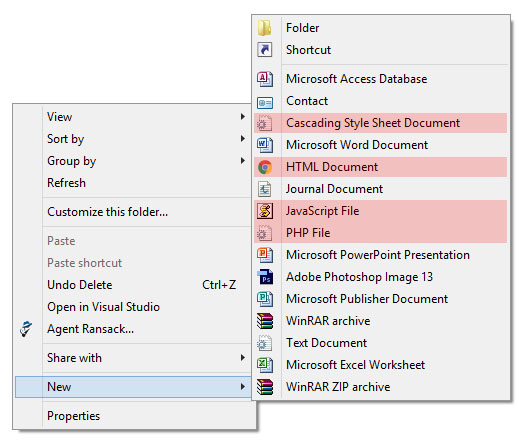 files and added them into "New" in context menu (How can I add an item to the 'new' context menu?). Currently, I've added 4 items; html, css, js, and php. "New" submenu got a little crowded. Now I'm thinking if it's possible to create a new submenu with a custom name (e.g. "Coding") that I can add these files. Actual "New" submenu would be less crowded and I could access these coding files easily under a new submenu. A second thought, this new submenu doesn't necessarily have to be just right in the context menu. It can be inside the "New" menu. I just want to group these four files. Worst case scenario, can I reorder the "New" submenu? I'd like to stack these four at the top or at the bottom. Update: I've created a repository for this functionality. Feel free to check it out. I've been searching for a solution to this, but the closest thing I came up with to what I want is adding a new item to the context menu which calls a script that makes a copy of a template file. This isn't really what I want, but this might give someone an idea, so I'll post this anyway. First, I searched for a way to add an item to the context menu. For example, Command Prompt. Following registry key does the job. Next, I want to add an item that creates a file, e.g., a CSS file. rename css.css "New Cascading Style Sheet Document.css"
I have a css.css template file in C:\Windows\ShellNew. 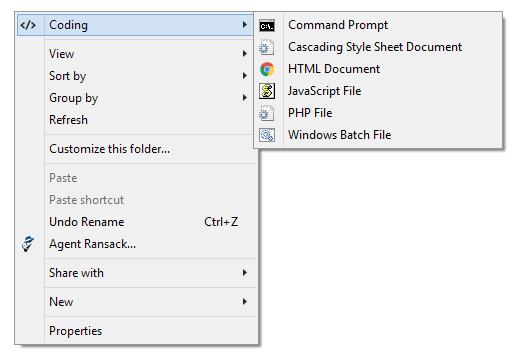 I simply make a copy of the template file in the directory where I right click and choose Cascading Style Sheet Document. Of course, I'll not use this method. This just complicates things even more. Imagine having all bat, css, html, js, and php files right in the context menu. I still need a better solution. Clicking on Command Prompt on the menu will run cmd.exe. This is straightforward. Tricky part is adding an item/app that creates a new file. Let's start with a CSS file. Following registry will add the item to the menu. While we have a new item with the name "Cascading Style Sheet Document", clicking on it, normally, wouldn't do anything. To make it create a new file in the current folder, we call a script. I have prepared a batch script for each file type that I want to create; bat.bat, css.bat, html.bat, etc. and placed them in C:\Windows\CustomNew. Also I have placed the template files bat.bat, css.css, html.html, etc. in C:\Windows\ShellNew. So whenever I click "Cascading Style Sheet Document" on the menu, I call the css.bat which makes a copy of the css template file and places it in the current folder. It'd be better just to create a new css file without calling any script, but I don't think that's possible. However, if anyone has an any idea, I'd love to hear it. I created the attached reg file "template" that helps create a menu with two submenus in Windows 10. I hope you find this useful. Delete all the comments in the reg file after you complete your submenu. Not the answer you're looking for? Browse other questions tagged windows batch windows-registry context-menu or ask your own question. Windows Powershell: Executing commands via the context menu? How do I add an icon to my custom context menu entry in Windows XP? 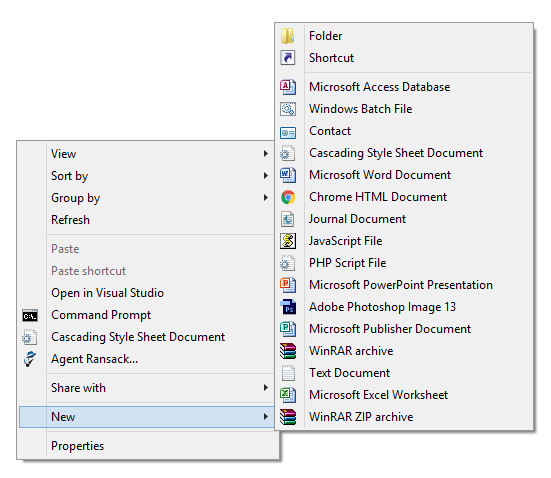 Windows Context Menu - New > RTF Document - But with Page Layout margins set to Narrow or Custom?